Definition at line 29 of file COutputDefinitionVector.h. Definition at line 27 of file COutputDefinitionVector.cpp. Definition at line 33 of file COutputDefinitionVector.cpp. Reimplemented from CCopasiVector< T >. Definition at line 38 of file COutputDefinitionVector.cpp. References CCopasiRootContainer::getKeyFactory(), mKey, and CKeyFactory::remove(). Definition at line 48 of file COutputDefinitionVector.cpp. 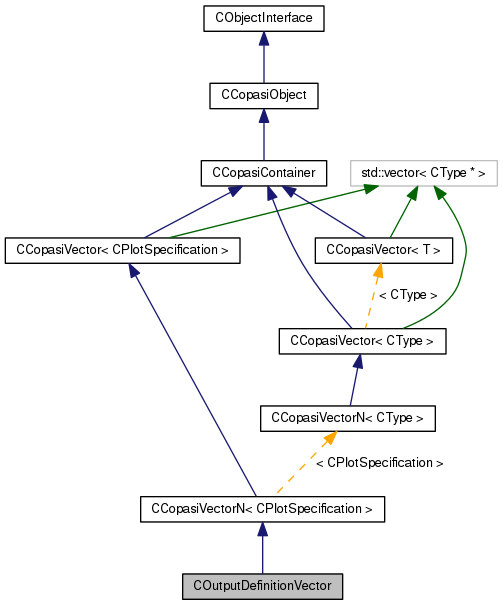 References CCopasiVectorN< CPlotSpecification >::add(), CCopasiObject::setObjectName(), and CCopasiVector< T >::size(). Referenced by CQPlotSubwidget::addPlot(), COutputAssistant::createDefaultOutput(), COutputAssistant::createPlot(), and SEDMLImporter::readListOfPlotsFromSedMLOutput(). Definition at line 43 of file COutputDefinitionVector.cpp. Definition at line 64 of file COutputDefinitionVector.cpp. References C_INVALID_INDEX, CKeyFactory::get(), CCopasiVector< T >::getIndex(), CCopasiRootContainer::getKeyFactory(), and CCopasiVector< T >::remove(). Definition at line 32 of file COutputDefinitionVector.h. Referenced by cleanup(), and getKey().